Based in San Francisco’s Japantown, the Northern California Japanese Sword Club is the oldest club in the United States dedicated to the study and appreciation of Japanese Swords and Armor, History and Art. Join us on the third Sunday of each month at the JCCCNC 1840 Sutter Street from 12:30 to 3:30 p.m. We welcome persons of all ages and levels of interest. The samurai sword is everywhere in movies, manga and animation it is known all over the world. It’s reputation is based on real world attributes that make it the finest weapon of ancient times. 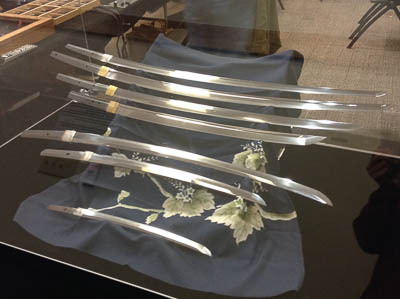 Each year the members of the Northern California Japanese Sword Club put on a display at the Cherry Blossom Festival, of the finest swords from their collections so that members of the public may see and learn about these fascinating works of art in steel. Join us on the first weekend of the festival in the Union Bank hospitality room, see swords, armor, sword guards and related art up close and personal. Ask our members any question and learn for yourself what makes the Japanese sword the finest sword in the world.